The Buyer: The buyer had a deep background in retail companies across various industries, and was looking for growth investment opportunities. 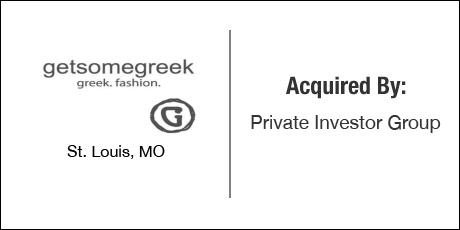 The Seller: GetSomeGreek designs and sells original and custom “fashion” apparel and accessories for fraternities and sororities all across the country. The Close: The buyer has a passion for business building and was seeking a company with high growth potential. GetSomeGreek was a family owned business owned jointly by a son and his parents. The son was looking for an investor willing to fund growth and the parents were looking for a liquidity event to fund their retirement. The DVS Group sourced the deal and successfully managed the objectives of all parties. DVS fashioned a creative and balanced deal structure that got the parents the financial security that they were looking for while simultaneously allowing for corporate growth thanks to the creative financial structure.